There was one other Fall collection I was dying to see come down the runway this week in Toronto, and that was Joe Fresh's Fall 2013. The affordable Canadian fashion power house has really been gaining credibility and success internationally, which is really exciting for a Toronto local. Their show is the hottest ticket in town, and I'm happy to see it did not disappoint. I could have gone without the ratty wigs all the models wore, but loved the clothes themselves. The dark collection featured details like sequins & rhinestones, lots of prints, pretty blouses with polka dots & ruffles, sweater suits, and laser cut tanks. There's lots of options for the office, or a night on the town, and the best thing about a Joe Fresh show, is that you know you can actually afford the outfits you like. I know it's only March, but with Fall being my favorite season for clothes, I can't wait to see these collections hit stores! 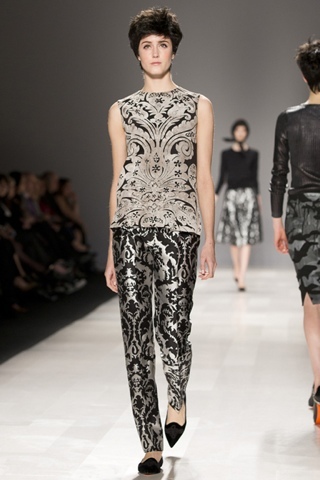 What did you think of Joe Fresh's Fall 2013 Collection? What was your favorite show this week?